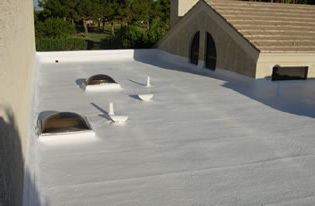 Spray Foam Roof ReCoatings help to remove leaks, prevent wear, and protects the roof. Quite simply, they are exactly what it sounds like. But the importance of this maintenance service cannot be overstated enough. Because of the immense wear that your roof goes through on a yearly basis, allowing your roof to naturally deteriorate for too long can add up to bank busting costs. Roof re-coats by 1st Class Foam Roofing avoid this costly fate by extending the life of your roof for many years of additional protection. The foam spray ReCoat doesn’t actually replace your original Spray Polyurethane Foam (SPF) roof, but instead it protects the original roof from becoming so dilapidated, worn, that you would need a whole new roof within 15-20 years. And nobody wants that to happen! Instead, the ReCoat is like the shield to the original roof. As all good shields or shieldsman do, they protect from the sinister elements. The ReCoat is no different. You need to protect your initial insulating investment from the relentless sun with a First Class ReCoat which allows the original foam roof done by 1st Class Foam Roofing to keep performing as if new years after the installation. And just like the original foam roof, a ReCoat is also an energy saver. It is 98% reflective of the sun and heat infiltration. Therefore, by using a ReCoat to cover the foam roof, you save money, reduce energy consumption, and preserve your roof year after year. The ideal time to start the ReCoat process is about 5 years after the original Polyurethane foam roof was installed. This way, you can be assured that you don’t let your roof go too long without that important protective barrier. But after that you may not have to ReCoat for another 20 years. Additionally, by ReCoating early on in the SPF roof’s life you ensure that the ReCoat was properly adhered to the original and that you don’t go too long where the original SPF roof is too worn to be ReCoated. When making the decision to apply a ReCoat you can rest assured that this regular maintenance is not only the most cost effective way to preserve your SPF roof but also the most environmentally friendly way as well. Worried that you don’t have the correct type of roof? Not to worry, it can be sprayed onto any flat roof substrate like build up, torch down, modified, and shingles. The ReCoat also extends the life of these roof applications as well. Plus, it has a heat infiltration reduction rate that is 98% reflective. 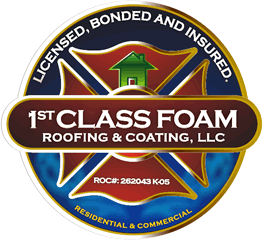 It’s a great decision to have 1st Class Foam Roofing do the maintenance on your roof as well as an excellent First Class ReCoat, which preserves your roof all the while as you watch the savings stack up.